Eggs in any style and of any sort – as simple as genius – was the theme of this month’s IMBB, picked after assiduous considerations by Viv of Seattle Bon Vivant. Which, in all honesty, left me a bit clueless. I love eggs, I use them all the time. But I never thought of them as a leading act – obviously a big mistake… After giving it a good deal of thought, two egg-specialties crossed my mind. As one of them is savory, one is sweet and none of them time consuming in the slightest, I decided to just do both. Actually, I’m almost ashamed to call it a recipe or dish, because it’s in principle just a boiled egg. BUT, sometimes it’s about the little things, which really could make all the difference. We call it “eggs in a glass” (I don’t know, if this is the proper translation, the German term is simply a description of how the soft-cooked egg is being served – well, in a drinking glass) and Oliver is definitely hooked on them. The long and the short of it would be: Cook an egg to your desired state, peel it, put it in a glass, salt it, smash it and eat it. Done! But hey, aren’t we on a culinary mission or what? To ensure we only use highest quality eggs, we have developed a routine, that has become a standard procedure and inseparable with the indulgence of eggs, which is: Visit the farmers market stand of your preference and purchase freshest eggs possible. The labels “free-range” and “organically fed” should indicate fair and healthy living conditions for the hens. I personally prefer buying eggs from the little stands, which offer a wide variety (usually in smaller amounts) of different farm products from their very own little grange. At Vikualienmarkt we have such a small stand, that sells fresh butter, bacon and some local specialties and of course: yummy tasting eggs. What comes with it, is an occasional anecdote about farm life every so often we shop there. Last time the owner told as about the fact, that brown hens are much more clever then their white buddies. Pardon me? How did he come to this conclusion? He told us, that from his own observation the brown hens always manage to break out or hop over the fence, wile their not-so-clever pale friends marvel at them, making lots of noise, but just don’t get it! After poking a hole in the egg’s wide end (should prevent the egg from breaking) carefully put it into a pot of simmering hot water using a spoon. Leave it there for… hm… this is the tricky part. I like my egg whites solid, but the yolks should be liquid to semi-liquid. The best way to find out the right duration for you is simply trial and error. Since we buy our eggs at the same stand in the same size, we finally figured it out: 8 minutes cooking time for “my” perfect results, 8 and a half minutes for Oliver’s perfect eggs. Well, that’s all assuming that the eggs are not stored in the fridge, which otherwise would change the required time again… lots of room for ‘error’ ;)) Now remove from the pot and hold them briefly under running cold water as it will stop the cooking process (besides, it’ll also support the next step). Try peeling the egg without burning your fingers or dropping the egg – an almost impossible mission. By the way, the fresher the egg the less easy it is to peel. Place the egg in a drinking glass and – here comes some family tradition into play – add some salt, cress, paprika (the spice) and mash the egg(s). The paprika delivers an entirely different experience for one’s taste buds – believe it or not, everyone I introduced this to fell for it. Even Oliver, usually rather skeptical about my eating habits, loves it! Put the egg yolks, the sugar and the hot water in a bowl and beat well for at least 5 minutes. A KitchenAid (or any other kitchen machine) can do a great job here… The mixture should change its color from yellow to very light yellow, almost white and its texture should be both creamy, yet quite stiff (hope this makes sense?). Add the mascarpone and beat again until the mixture has a consistent look. Fill a form or glass with some of the mixture, just enough to cover the bottom. Pour the cold coffee in a flat bowl and soak the ladyfingers for some seconds, then arrange them on the mascarpone-egg mixture. I love my tiramisu quite juicy, so I soak the ladyfingers for a little longer, but that’s just a personal preference. Add another layer of the mixture, again soaked ladyfingers, …end with a layer of the mascarpone-egg mixture and dust with lots of unsweetened cocoa powder. Chill for at least four hours. And don’t keep (chilled) leftovers for longer than 24 hours, just a precaution because of the uncooked eggs. But there have NEVER EVER been leftovers! oh, you have the same spoons as we do. Gotta try that egg in a glass. Great idea. Simple yet charming! That's one of the reasons I was so looking forward to everyone's posts. A simple poached egg on a suny morning. A great start for a day! The tiramisu looks yummy! Great pix. And sometimes a boiled egg, especially if it is fresh, is the best way to eat it. Yum. who would have thought a boiled egg could look so good? I love mine with the whites cooked but still runny with a good dose of white pepper and soy sauce. The tiramisu looks positively decadent!! Interesting recipe for tiramisu. I'll have to try it. And yes, many of my recipes use uncooked eggs and I even keep in the fridge for more than 24 hours without any harm. The egg in a glass is unusual. I still like the soft-cooked eggs in a shell, but never had them in a glass. 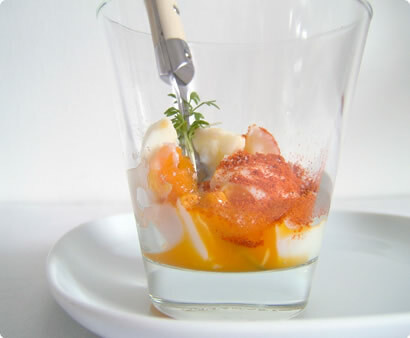 So simple (the egg in the glass), should be so obvious too - yet I never thought of serving it like that! Your tiramisu looks stunning too Nicky - I've never made my own, but if I do (and have a sneaking suspicion I will soon) I'll be sure to use your recipe! Wonderfully written and photographed post as usual! I am going to give the paprika - egg thing a try. I'll let you know how it goes. We do this with eggs in Greece a lot. Put then in a glass I mean. We actually add a bit of olive oil, coarsly grounded black pepper, and a few bite size pieces of bread crumps. Deliscious! I have been reeading you since your first post. You have a magnificent blog, both in content and appearance! Yum - great eggy ideas! I'll have to try the smashed egg in a glass, if nothing than for the great-sounding name. I also eat raw eggs without thinking twice, which gives me even more of an excuse to only buy organic free-range - apparently they have a miniscule risk of salmonella compared to factory eggs. Your paprika-egg-idea: Do you mean »sweet« paprika or hot paprika (Rosenpaprika)? hi nicky, this is the first time i'm visiting, thanks to being tagged for the meme you started - good one! It seems it's more common in some countries than in others; similar to Greece (like Argy said) in Germany it's really a standard item on almost any restaurant's breakfast menu. Thank you for the kind words and the suggestion with the breadcrumbs. It sounds 'logical', but I have never had them that way - will definitely give it a shot, too! Thank you for stopping by. I keep my fingers crossed and thumbs pressed for you, hopefully you'll find a decent farmers market soon. Runny eggs with white pepper and (usually dark) soy sauce is quite the Singaporean institution and often paired with crunchy toast slathered liberally with butter and coconut jam (aka kaya) . The whole lot is then washed down with a cup of strong local coffee. mmmm, just tried the egg in a glass, but I didn't have any paprika handy, so I tried it with ground turmeric. It was awesome! You should try it!! 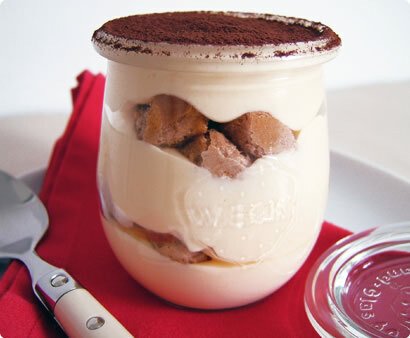 Where on earth can I find something similar to the container you used for the Tiramisu? I have been looking for something just like that here in the US, and am wondering if it is maybe something that can be easily found in Germany? Hi ketket, the jar I used is an original Weck jar which has quite a bit of history in Germany, but they're also available in the US. You can find more information here. When making Tirmisu for a special friend of mine which looooves everything with liqour (Kalhua, Bailey's), I add a few tablespoons to the coffee and it balances quite well with the sweetness. Apart from these few hints, I just want to say that your blog is one of the best I've seen ! You go girl ! This recipe looks great! I love tiramisu and I have never tried to make it on my own! I've always been amused by foreigners love for tiramisu' and I like this version too. 3. in my region (Modena) we have a cake (Torta Barozzi) that tastes like a very strong chocolate-coffee cake. We love to use this cake instead of lady fingers (with a few drops of Strega).